No longer waste time doing mundane activities like fix badly flowing water! One of Minecraft's oldest surviving projects (since Minecraft Alpha)! WorldEdit works on either single player or on a server. While you may not often need a map editor, WorldEdit won't extend your load times at all and has no impact on your game until you use it! It causes no mod conflicts and it will be there when you need it. Run a Bukkit (or Spigot) server? 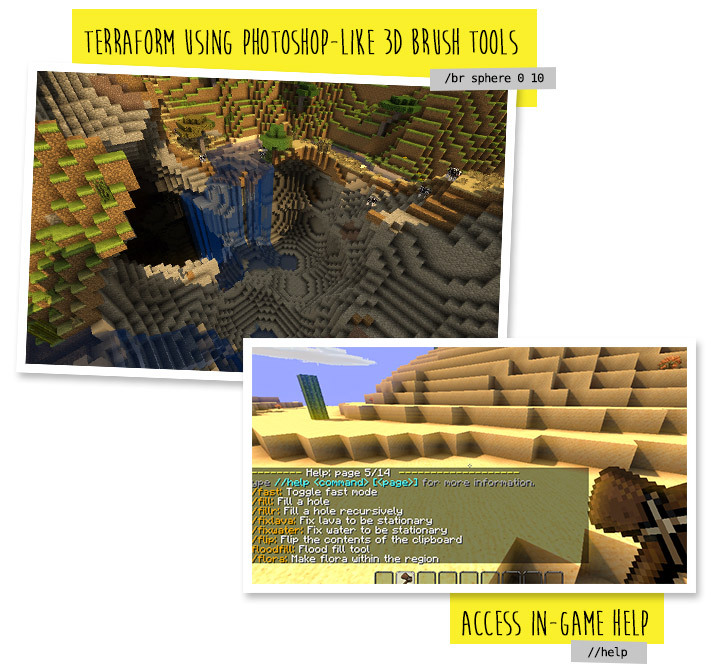 Get the WorldEdit plugin! And if you need to distribute modpacks, check out sk89q's modpack launcher platform. 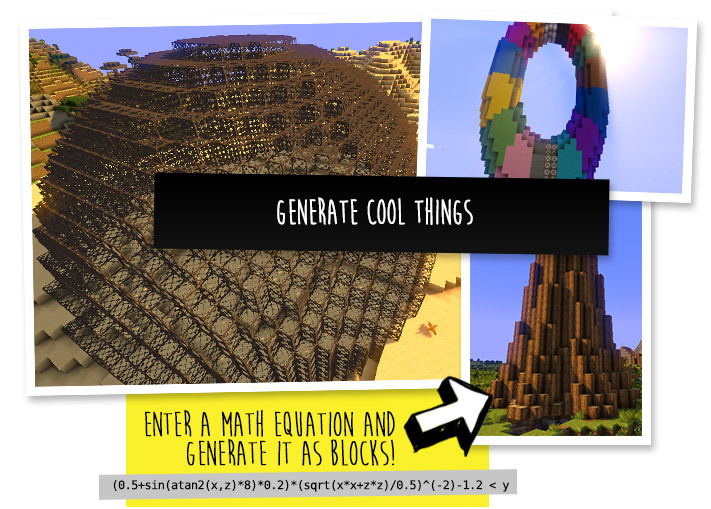 You can also use it to make and test modpacks easily. 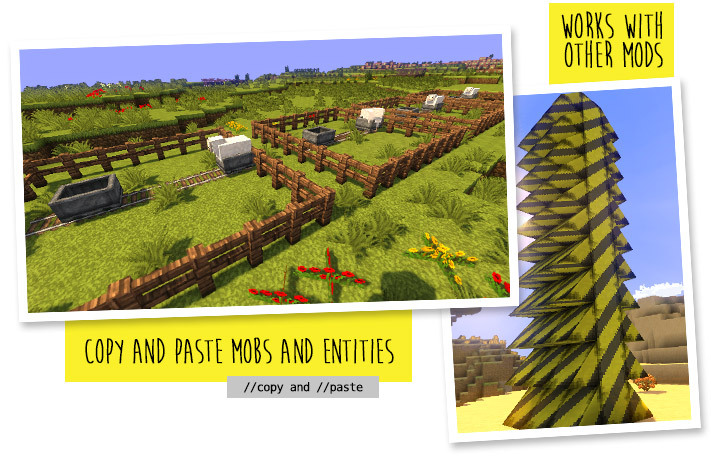 Download WorldEdit and put the file into your "mods" folder. Do cheats have to be enabled? If you're playing on single player: Yes, cheats must be enabled for the world to use WorldEdit, but you can change this in the configuration. If you're running a server: Only opped users can use WorldEdit, though this can be changed too. Read the quick start guide first. To learn how to use WorldEdit, read the wiki. Check YouTube for tutorials too! You may visit our Discord Guild or ask @the_me4502 on Twitter. Visit our issue tracker. However, if you just have a question, please try one of the methods above. Can I include WorldEdit in my modpack? You are free to include WorldEdit, without having to asking for explicit permission. A link back to this page or sk89q's Patreon would be appreciated, however. 1.13? plez? or r u waiting till 1.14 since its so close? hello i dont know if this will never be updated but do you think you can add biomes o plenty leaves and blocks for world edit? Please, do a version to MC 1.12.2 ! Will it be updated to 1.12.2 anytime soon? I'm using it with 1.12.2. Is this likely to cause any problems? Not sure if this is just me or if there is a bug?? when trying to change the biome it says biome is changed and i may need to close and reopen the game. But nothing is changed, and even when i close and reopen the game theres been no other change. Anyone else experience this? changing blocks and stuff works just fine. Still unable to copy armor stands, villagers, ... normal? Having both of these installed will cause crash when attempting to load/create world. Will there be a version for Minecraft 1.11.2? I know that the 1.11 server version works on 1.11.2, but not the singleplayer (Forge) version. The version for 1.11 works for 1.11.2 singleplayer forge. I get this same error for WorldEdit, and now CraftBook. Dude - I'm dying here - please help me understand why none of your plugins will load... meanwhile virtually any other plugins I install load without errors? I've tried on Spigot 1.11 and 1.11.2. Nevermind. I had to go searching for the Bukkit version and now everything works. The default download above points to a Forge version, which was the culprit. I know how to worldedit,but when I put commands and it said my worldedit isn't permitted.How I can fix this?